Anyone interested in reading a review of the clinical trials to date in the nutrition / omega-3 field especially in child populations will find it a fairly eclectic mix of data and outcomes. Understandably, this has given rise to criticism and mis-conceptions and in some extreme cases rather unfortunate claims of quackery or bad science from external observers (and in some instances deservedly so). It is often the case that researchers with strong training or background in a specific field such as criminology may make a not so quantum leap into another field, i.e., nutrition, in their search or consideration for other potentially contributing variables. Therefore, a proportion of the nutritional omega-3 clinical intervention trials are designed by those entering the field or by food companies wanting to invest in a small clinical trial in order to achieve positive results which may facilitate the marketing of a new product. It is important to remember also that nutritional trials are among the hardest to design, control and conduct for many reasons – nutrients also work synergistically and isolating their effects is complex. The background diet of the volunteer participating in the study is also very hard to control despite your best efforts they may not admit that they have started eating more fish although they are in the placebo group or in contrast are snacking on junk food in between study meals in spite of a strict inclusion/exclusion criteria. Blood samples really are the only way to measure compliance. Cross-discipline research is arguably the future of clinical research as increasingly it is apparent that there are not single isolated variables but more intricate biochemical substances at play, often working synergistically. However, one major bone of contention is that a proportion of nutritional intervention trials are designed without consultation or the extensive input of trained professionals e.g., biochemists who arguably understand their complex functions best and can discuss recommendations concerning dose, formulas, mechanism of action, bioavailability, supplementation periods and of course tools which are reliable and sensitive enough to detect change. There are concerns among the omega-3 scientific community that some of these poorly designed studies produce post-hoc results of a correlational nature which then grab unhelpful media attention. Another major concern is the all-too-common grouping of all polyunsaturated fatty acids (PUFAs) with no obvious reference to their functional distinctions. Omega-3 and omega-6 for example are functionally different. A recent publication in the British Medical Journal by Dr. Ramsden and colleagues (2013) rescued and re-evaluated data from a clinical trial called The Sydney Diet Heart study . The purpose of the trial, which was conducted between 1966 and 1973, was to test the use of dietary linoleic acid (LA) for secondary prevention of coronary heart disease and death. The re-analysis and publication of this data revealed that increasing the n-6 polyunsaturated fatty acid LA from safflower oil and safflower polyunsaturated margarine increased rates of death from cardiovascular disease, coronary heart disease, and all cause mortality compared with a control diet. This is the first published report to show an increase in mortality from cardiovascular disease and coronary heart disease, comparing this LA intervention to the control group, and demonstrating that the magnitude of increased omega-6 LA intake was associated with higher risk of death . 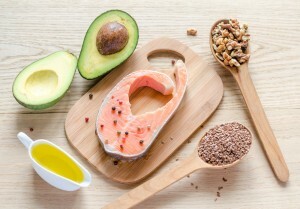 This study also highlights that omega-3 and omega-6 fatty acids have distinct roles which need to be more closely considered by those entering the field.